Save time from having to work out problems on your own and focus on seeing what your child needs with this convenient answer key. The steps to the answers are laid out so that you know how to correctly teach your child how to get the right answers. 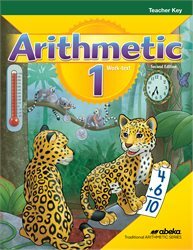 Evaluate your child’s math success using this teacher key to your student’s Arithmetic 1 workbook. With all of the answers given, you can be sure to answer all of your 1st grader’s math questions.